The motif origin of this print goes back at least 2,000 years to ancient China. "One of The Twenty-Four Exemplars, Yong Quan Yue Li was developed and derived from the story about Jiang Shi's wife recorded in 'Records on Huayang State: Sichuan' and 'Book of Later Han Dynasty: Honored Women.' The story is as follows: in the time of Eastern Han Dynasty, Jiang Shi in Sichuan province “served his mother filially,” and his wife, Lady Pang, "was even more respectful” to her. 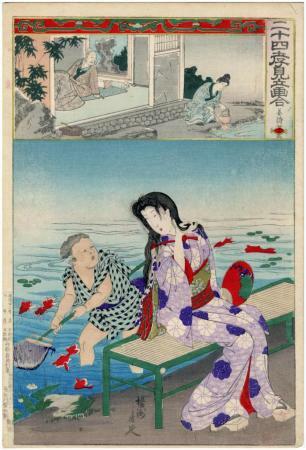 Since Jiang Shi's mother “enjoyed drinking water from the river and eating carp,” Jiang Shi's wife would go to the river 6 or 7 miles away from their home to “laboriously draw the water.” She “cooked the fish, and served it to the mother, who would often invite the neighbor's mother to join her.” However, one day Jiang Shi's wife came back later than usual from the river because of a strong wind, and. [sic] She was accused of neglecting her mother-in-law, and she was expelled from the home by her husband. Jiang Shi's wife then took shelter with her neighbor. Nevertheless, she persisted in loving her mother-in-law, “weaving day and night, buying the fish and serving it to her mother-in-law through the neighbor." The mother and son finally found out the truth and forgave Lady Pang, and took her back into the home. Unfortunately, soon after that Jiang's young son drowned in the river as he was drawing water. Fearing that the elderly mother would be die of grief, she disguised the news and saying that “the lad was in school.” These acts so moved the gods that they created a fountain beside the house. And each day two carp would jump out of it. Jiang Shi's wife would cook and serve them to the mother-in-law." Quoted from: Love in the Religions of the World, p. 202. Hasegawa Tsunejirō is the family name of the publisher Shimizuya Tsunejirō.